Boys love to spin until they collapse. Is the world then spinning out of control? Preparations for renegotiating the Nonproliferation Treaty. All for swinging you around.... Objectivity is stupid. If you're going to spend time writing about the arts, there's no reason not to be a cheerleader for the work that moves you, or to at least spend as much of your time writing about that work as you possibly can. To that end, it's worth acknowledging upfront that I pretty much always like the films of Henry Hills. I find his sensibility both rigorous and funky, at a bit of a skewed angle to more dominant recent trends in experimental cinema but also firmly planted in the rhythms of hot-media nowness. He's a polymath, drawing in ideas from multiple disciplines -- the NYC downtown avant-jazz and neo-art music of John Zorn, Elliott Sharp and Zeena Parkins, cut-up audio-workers like John Oswald and Christian Marclay, as well as the "Language Poets," all of whom share with Hills an obsession with micro-syntax, the isolation of discrete units as signifying elements from which to construct discontinuous tapestries, crazy-quilts of shape and gesture. By comparison, Failed States is downright subdued, and it might take a few spins for its exceptional character to sink in. Failed States is a study of spinning elements, rotation as gesture both mechanized and organic. 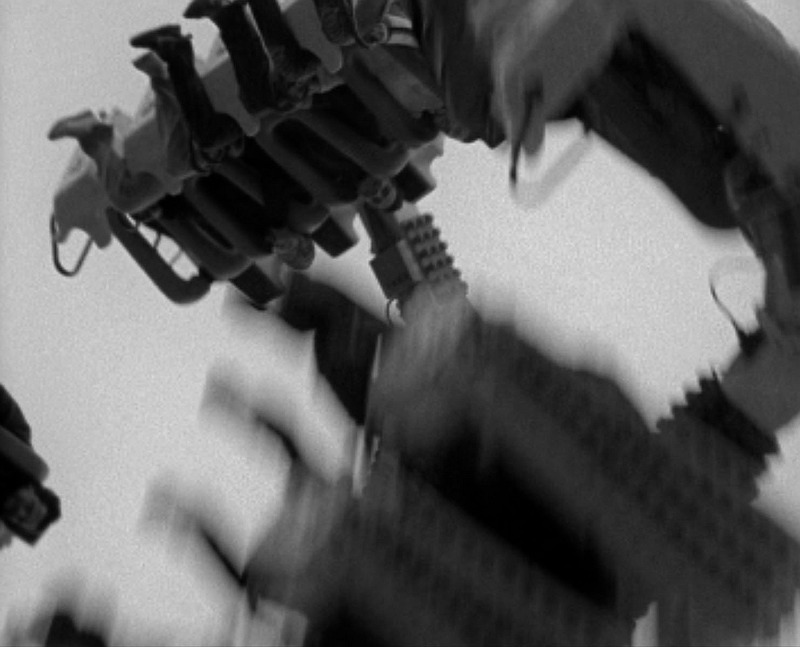 The first part focuses exclusively on carnival rides, in particular a multi-pronged tilt-a-whirl which lifts its cars up and down while rotating them on the ends of the arms. Hills cuts quickly between day and night shots, always on the action, so that we're getting a terse, punchy average of this machine's mobile parameters. 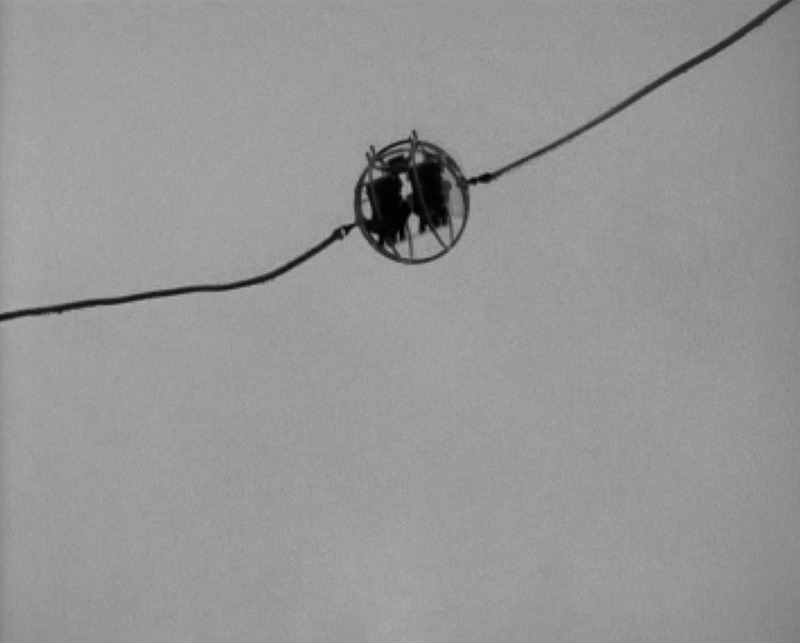 We see its cranelike projection silhouetted against the sky, or its base in low eyeline shots. In either case, Hills is isolating repetitive motions and light patterns to emphasize regularity of operation, "the spin" as a product the machine is there to give you. Then, Hills shows us three very surprising shots: Keith Sanborn, Vincent Grenier, and Bradley Eros all spinning in the street with their arms extended. What a hoot! 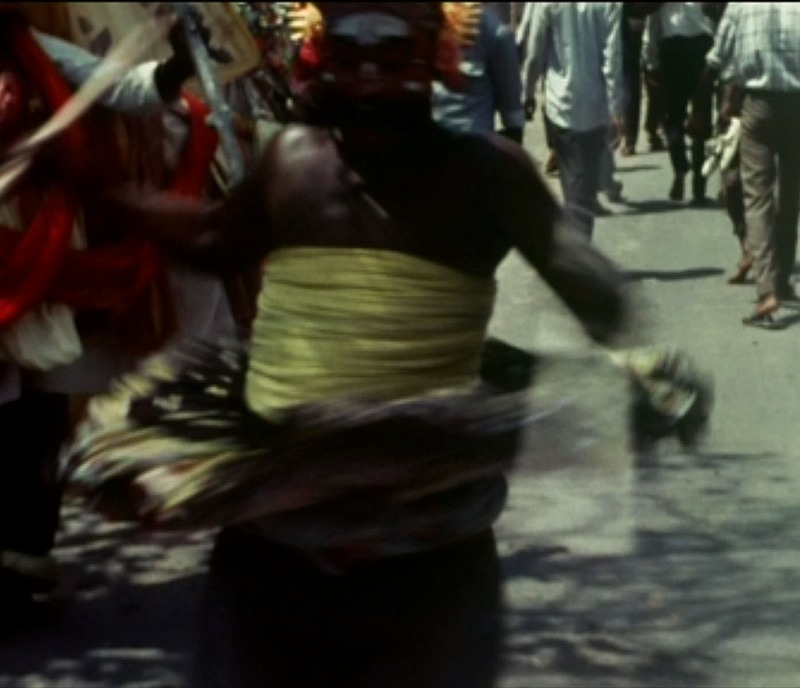 Before long, though, Hills is establishing a rhythm whereby he returns to the carnival footage but intersperses it with passages taken from the middle of Manhattan, in which Hills is "the monkey in the middle," spinning himself and the camera around and around. Streets, stores, and billboards whizz by, eventually becoming abstract streaks. Added to this is yet another element: similar "spun" footage of amber dusklight through trees, the foliage patterns becoming more and more unresolved until the screen is awash in gold and black horizontal light. And, in part three, we see children spinning in their yards, much as Hills' filmmaker friends were at the start of part two; along with dervishes in a festival procession, giving their own "spin" on the otherwise secular goings-on. Now, I realize that the description I've just given reads like a laundry-list, and I've failed to provide an adequate sense of how Hills' organization and pacing serves to articulate these various elements within the totality of Failed States. 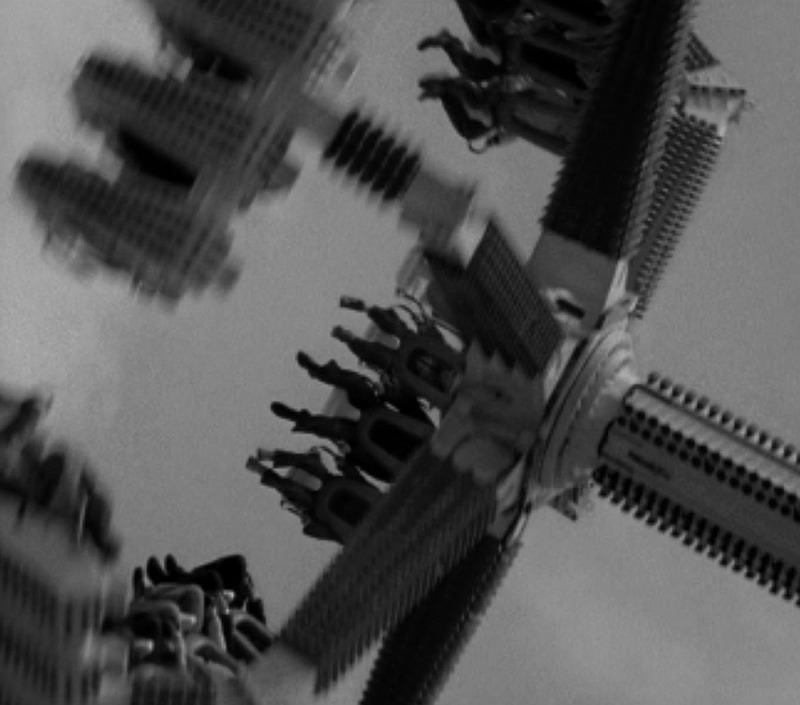 To offer just one example of this, Hills' combination of the accelerated abstraction of the city and forest first-person POV spinning, with the introduction of a somewhat detached third-person image of the Sufi whirler, operates to induce analogy across a cultural divide, but from a highly palpable position for the viewer. Only when we're fully ensconced in the physical sensation (the thrill, really) of the camera's spin does Hills introduce the "otherness" of the Sufi, so that we're already, to some extent, inside his consciousness. But above and beyond this, Failed States is remarkable because,among its other virtues, it combines multiple layers of avant-garde film history and memory. The link to the fairground, naturally, asks us to think of cinema as an "attraction," a non-narrative mode the provokes the senses. As Tom Gunning famously contended, this is a common link between early cinema and the avant-garde. But more than this, Hills' goofing around with friends, his use of camera motion to explore abstraction and velocity, his identification of "advanced" states of vision with childhood, takes us through the "Baudelairean," the "mythopoeic," the "structural," from the urban to the rural and back again. Failed States is materialist to its core, but it all about the extremities of sensual and psychic states. All in less than ten minutes! Plus, my kid loves watching it, but only while I spin her in my office chair.